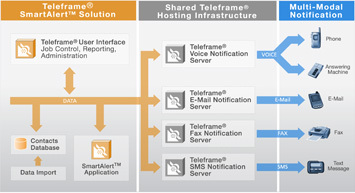 Teleframe® SmartAlert™ is an automated multi-device notification service that utilizes our advanced hosting infrastructure to enable businesses, government agencies, and non-profit organizations of all sizes to perform complex multi-channel notification campaigns using voice, pager, fax, e-mail, and SMS messaging. SmartAlert™ can be used to instantly get notification messages out for reminders, employee announcements, political calls, product updates, alerts, financial news, school announcements, advertising promotions and much more. 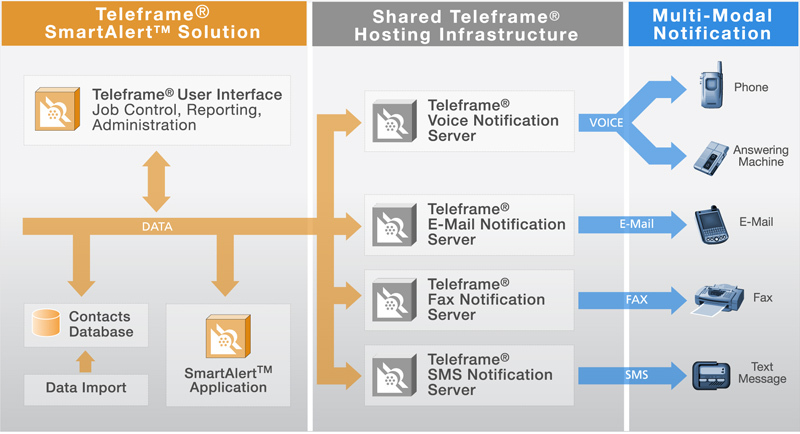 SmartAlert™ is fully integrated with our VoiceXPress™ service for bulk outbound voice messaging and SmartGuard™ for incorporating event triggers into your business applications. SmartAlert™ utilizes a powerful queuing engine to drive your campaign and bring you results. Job campaigns can either be setup for you by Diagenix or independently using an easy-to-use web interface. Import with Ease—A simple way to import your data into a notification job campaign queue including duplicate record screening and incomplete data filtering. Start, Stop, Monitor & Track—Pause or resume one or more notification job campaigns, re-configure notification job campaign settings on the fly. Monitor job campaign progress and review statistics. Fax Machine Detection—99% accuracy rate for detecting fax machines. Extensive Capacity—Accommodates any notification volume. Voice Messaging—Fully integrated with Diagenix VoiceXpress™ for outbound voice messaging requirements. Real-time Visibility and Reporting—Web based monitoring and visibility of your job campaign in action including advanced reports. Multiple Message Support—Play messages based on connection type or interactive responses. Web Service Interface—Easy integration to your existing systems for end-to-end campaign processing. We make getting started with SmartAlert™ fast and easy. In most cases we can get your first notification campaign up and running within hours. Subsequent campaigns require even less time to setup—you can run them as often as you like. Total Managed Service—Diagenix takes care of everything, from requirements, setting up and importing your campaign file, recording and/or drafting your message to implementation, monitoring and reporting. Shared Managed Service—You ship us your campaign file, message and/or voice prompt and we setup your job requirements, implement and monitoring the results. To get started with SmartAlert™ simply contact our sales department and a representative can walk you through setting up an account. Once an account has been setup you can upload your contact information and sit back and let SmartAlert™ do the rest.